(June 1, 2018 - Vernon Hills, IL) – For the first time in history, the public has the ability to legally wager on their favorite bar game, Golden Tee Golf. On June 8 – 10, 64 of the best video golf players in the world will square off at the Golden Tee World Championship, held in The Orleans Showroom at The Orleans Hotel and Casino in Las Vegas. And Boyd Gaming is offering wagering on the event. Recently the Nevada Gaming Control Board granted approval for licensed Nevada sports books to offer wagers on the winner of the high profile World Championship event, and odds are currently being posted at all 11 Boyd Gaming Nevada properties. 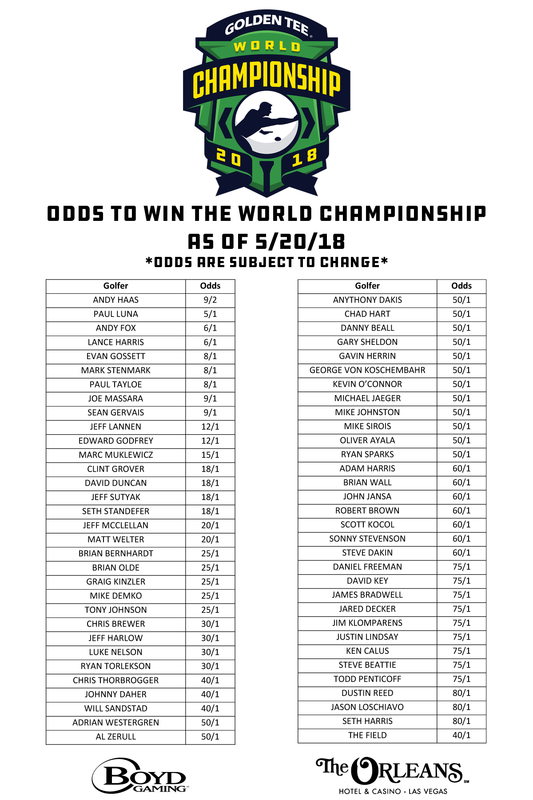 Andy Haas of Ohio, known on Golden Tee leaderboards as “Ship-it”, opened as a slight 9/2 favorite to win the 2018 Golden Tee World Championship. Haas has won two World Championships already—in 2008 and 2016. Paul Luna of Missouri (5/1), Andy Fox of Minnesota (6/1) and Lance Harris of Arizona (6/1) opened as the next selections. Mark Stenmark, last year’s champion, was near the top of the field at 8/1. Bets will be accepted until 11:30 AM on Saturday June 9. The competition begins at noon that day with a 5-course qualifier that seeds the brackets. Head to head bracket play begins at 11:00 AM on Sunday June 10, and a winner will be crowned around 6:30 PM. The new champ walks away with $20,000 and Golden Tee immortality, while those who bet correctly can share in his success. The 3-day event is open to the public and will be streamed live on YouTube, Twitch and Facebook Live. Golden Tee Golf has awarded more than $100 million in prize money through online skill-based contests and tournaments, and has pioneered the eSports genre. Licensed books electing to offer these wagers must provide the Enforcement Division with notification of terms via email at ops@gcb.nv.gov. More information on Golden Tee and the World Championship, including live championship leaderboards, can be found on www.goldentee.com. Incredible Technologies is a Class-III gaming manufacturer focused on delivering compelling video slot content to the modern-day casino floor. The company headquarters are located in the Chicago suburb of Vernon Hills, Ill., with a remote office in Las Vegas. Incredible Technologies specializes in the design and development of digital entertainment products to game operators and players. Incredible Technologies is the largest manufacturer of coin-operated video games in the United States with its flagship product, Golden Tee® Golf, recognized as the most-successful pay-to-play video game in history. Incredible Technologies is an associate member of the National Indian Gaming Association, American Gaming Association, Association of Gaming Equipment Manufacturers and is a certified Women's Business Enterprise.